The 2017 4-H dog shows are unlike other animal shows at the Delaware County Fair. The dog shows have grown at the fair — when they began, everything was on a single day, said Becky Karshner, another event adviser. Now, there’s three separate days of shows, said dog committee chair Shelly Harris. Yes, it takes a lot of help from organizers and participants alike to stage the show. On Sunday, there was the showmanship portion of the dog show that started things in the morning. A volunteer from one of the dog clubs said it would last a half-hour, but it ended up being two hours. Each 4-H student brought their dogs into the junior fair show arena on a leash and walked them around the ring as the judge instructed, in different patterns. The kids had treats in one hand and are allowed to “bait” their dogs. At times, the dogs had to show their paws or posture for the judge. Near the end, Judge Amy Rowe from Allen County asked the Showman of Showmen competitors, “What’s the number one rule of showmanship?” Competitors said showing off the dog, or teamwork, but Rowe said it was “keeping control of the dog’s head, which is a safety concern.” She gave advice to the participants and said everyone did a great job. Dimitri DeCoster of Powell Sew & Sows was named Showman of Showmen and won the Intermediate Showmanship class. His brother, Donovan DeCoster, was Reserve Showman of Showmen. Donovan was the 2016 Showman of Showmen. Other winners were Alivia Armentrout from the Scioto Dog Club in Junior Showmanship and Hannah Ramsey in Senior Showmanship. Following the showmanship portion, there was a costume show. The advisers said Mazie Fitzharris of Delaware Trailblazers won Junior and Best Costume in Show for her Horse Parade-themed outfit; and Lydia Bendele of Rabbits and Roosters won Intermediate Costume. To finish the day-long event, there was an obedience show. Winners included Ramsey; Lydia and Rachel Bendele; Sara Reed of Just Lopin’ Around; Michaela Procicchiani of Set 4 Success; and Erin Beaver and Natalie Pedigo, both of Scioto Dog 4-H Club. Monday’s dog event only took about two hours — the dog agility show. This event takes place in the back of the fairgrounds west of the Horse Arena, which the organizers said is both good and bad. The grassy area is ideal for the dogs to run around without hurting themselves, but the location is also remote and not many attendees know where it is. 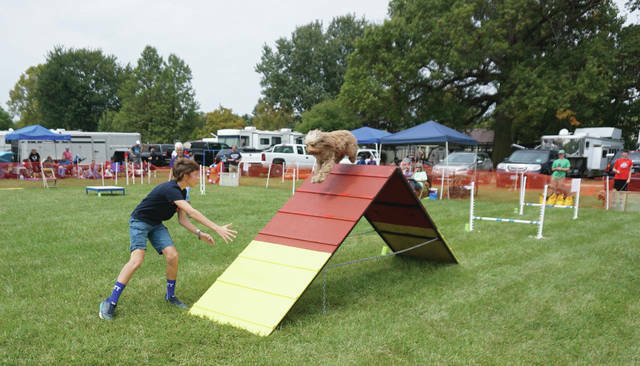 The dog agility show is the canine equivalent of American Ninja Warrior — the 4-H competitors coax their dogs to run an obstacle course of jumps, tunnels, an A-Frame, a raised narrow beam and a table, where the dog must lie down for five seconds before completing the final jumps. Any breed of dog may compete, Harris said, but they need to be at least 18 months old so that their bones are fully formed. There were different types of courses constructed, with jumps at different heights depending on the size of the dog. Among the class competing were dogs on leashes and dogs without a leash. Karshner said entrants had 60 seconds to complete the course, but the mightiest of dogs can zip through in 30 seconds. However, bypassing or failing to negotiate an obstacle incurred a time penalty. Some dogs were pros, and others wanted to play with their owners or were distracted by other dogs, and weren’t worried about finishing. No matter, everyone was in good spirits, encouraging and cheering the dogs on, as well as their bewildered but laughing handlers. Those who finished the course in time received medals, Hedges said. The dog show concludes Saturday, Sept. 23 with the Dog Rally Obedience and Fun Show at 9:30 a.m. in the Junior Fair Show Arena. Donovan DeCoster of the Powell Sew & Sows club leads his dog over the A-frame on the agility course at the Delaware County Fair on Monday. Donovan had one of the faster times of the day.